It’s an aircraft with a reputation for falling from the sky. But on at least one occasion, the U.S. military’s controversial V-22 Osprey tiltrotor — a hybrid transport that takes off like a helicopter and cruises like an airplane, thanks to its rotating engine nacelles — did just the opposite. It flew upward, out of control of its pilots. Luckily, the three crewmembers were unhurt. The cost to repair the self-flying Osprey totaled $7,068,028, according to the Naval Safety Center, which tracks all Navy and Marine aircraft mishaps. An investigation by the Navy and manufacturers Bell and Boeing resulted in tweaks to the V-22’s engine controls. Yet the Marines and the Naval Safety Center ultimately decided that the Osprey’s dangerous joyride didn’t count as a serious flying accident, known in Pentagon parlance as a “Class A flight mishap.” The reason, said Capt. Brian Block, a Marine spokesman: The aircraft wasn’t supposed to take off just then; therefore, it’s not a flight problem. If a V-22 suffers damage while preparing to launch or after landing, or if the crew does not explicitly command the aircraft to take off but it does anyways, then the accident doesn’t count as a flight accident. It’s not the only seemingly serious accident that the Marines neglected to include in its tally of flight mishaps for the Osprey. A review of press reports, analysts’ studies and military records turns up 10 or more potentially serious mishaps in the last decade of V-22 testing and operations. At least three — and quite possibly more — could be considered Class A flight mishaps, if not for pending investigations, the “intent for flight” loophole and possible under-reporting of repair costs. 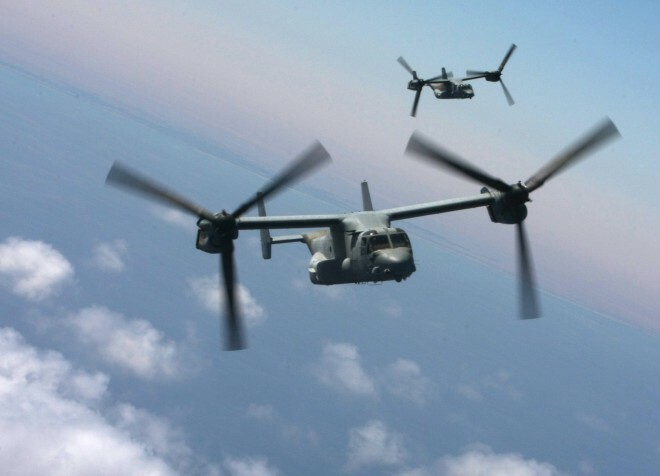 The Marines boast that the Osprey is the “safest tactical rotorcraft within the U.S. Marine Corps” over the last decade, in the words of Lt. Col. Jason Holden, the V-22 plans officer at Marine Corps headquarters in Virginia. By the official reckoning of the Marine Corps and the Naval Safety Center, the V-22 has a Class A flight mishap rate of 1.28 per 100,000 flight hours over the last 10 years, compared to a Class A flight mishap rate of 2.6 per 100,000 flight hours for all Marine aircraft over the same period. But the Marines have given all sorts of reasons not to trust that official rate.